I had been thinking kadai paneer and paneer jalfrezi are one and the same untill I visited an Indian restaurant here. The reason behind my assumption is that the ingredients required for making both the dishes were common. But after seeing the menu card at the curry house here, I was little curious to know what's the difference. So, once I returned home, after few searches, my conclusion is here. The dish grabs the name from its cooking method rather than the recipe of it. During the period of British rule, the dish was named as it involved cooking / reheating the left-over roasted meat through stir-frying by adding extra chillies/sauces. Over a period of time, Indian restaurants have adopted this cooking method, however the meat is not the left-over, instead they use fresh meat/vegetables to make this jalfrezi. As it is stir fried, the ingredients like onion and other vegetables are clearly visible in this dish. I hope these details are sufficient to understand what is paneer jalfrezi and how it differs from kadai paneer. Now, off to the recipe. 1) Dry roast cumin seeds, coriander powder and dry red chilli. Pound coarsely. You can you mortal and pestle for this. 2) Heat oil in a pan and add ground ingredients once it is hot. Fry it well. Make sure not to burn the masala here. 3) Add onion and fry till it gets cooked and retains its shape. 4) Add ginger garlic paste and stir fry for a minute. 5) Add tomato and fry it for another 2-3 minutes. 6) Add red chilli powder, coriander powder, amchoor powder, turmeric powder, garam masala and salt. Cook until the raw smell of masala goes off. 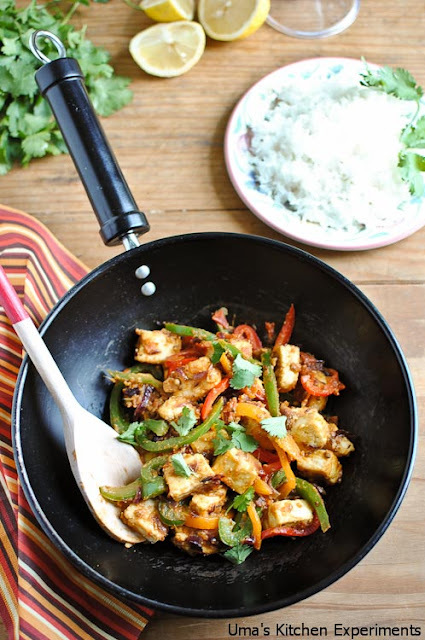 7) Add capsicum followed by paneer and stir fry it till both cook well. 8) Garnish with coriander leaves and serve with roti or pulao. 1) I used both coriander powder and seeds as family preference. you can go for any one for preparing this dish. 2) You can also add the ground ingredients (as said in step 1) with masalas instead of adding them initially. 3) Increase the lemon juice/amchoor powder as per taste. If you are using lemon juice add it at the end of preparation. Supperra irrukku....Thanks for sharing the info on Jalfrezi and kadai paneer, I also used to think them to be the same dishes. Great presentation and wonderful dish !! Looks absolutely delicious.. awesome preparation.. thanks for sharing !! Yummy paneer jalfrezi..I too have a similar jalfrezi(non veg) in my drafts,will post soon n same pinch I too recently found out the difference !! Those bell peppers tars catching my eyes! Cute n colorful! You have done a good research Uma! Nice recipe. 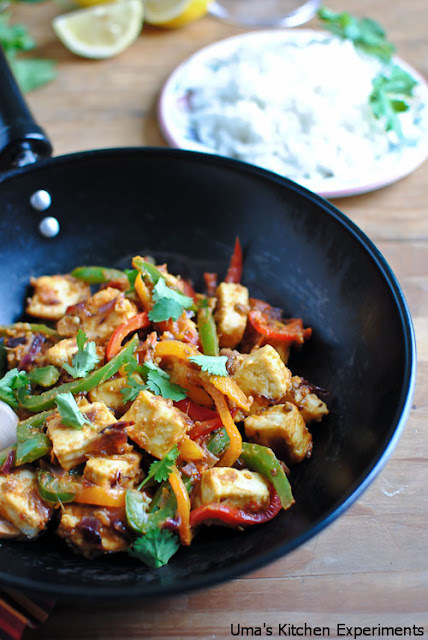 Slurp,stunning and super tempting paneer jalfrezi.. I too didn't know the difference before. But the title and the pics made my mouth water. Looks really yummy. 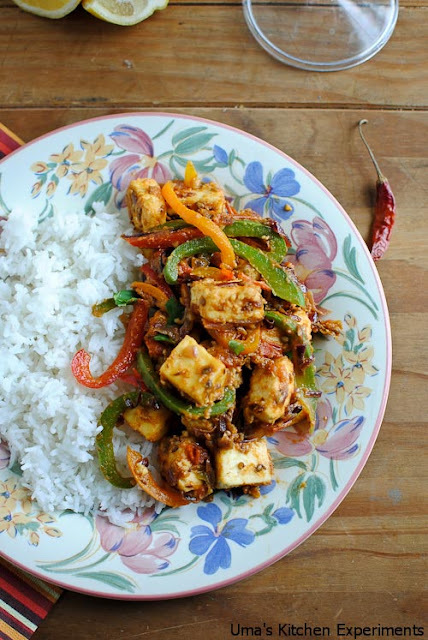 Paneer Jalfrezi looks super tempting! I am in love! I love paneer and love all those paneer dishes you are posting. 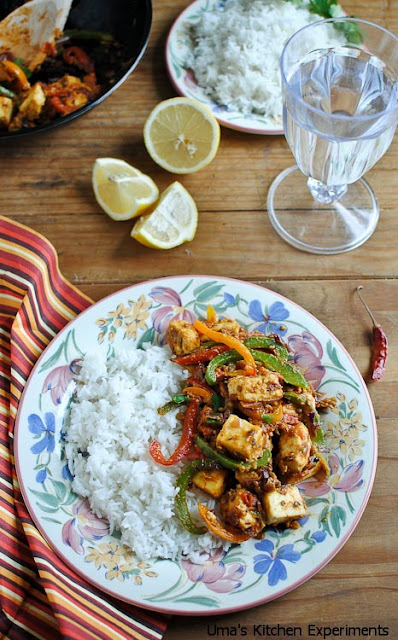 Wow great paneer dish. Its truly new to me. The dish looks lovely! despite growing up in Delhi and so many Punjabi friends, i did not know the difference between the two dishes...good explanation!